The Chicago Auto Show opened this weekend. To celebrate, I'm re-visiting some of my favorite car-related columns from years past. There are a few things that make me wince—those six dashes in a single sentence in the second paragraph. But generally I'm surprised and pleased at how much, at 24, my narrative voice was the same as it is now, and there are a few novel metaphors that I am proud to have coined. "Would you like a 1985 Corvette?" the Chevy man said, flashing a smile that was friendly and kind. "Yes, please," I answered, sensing my journalistic integrity melt away like a snowman in the spring thaw. 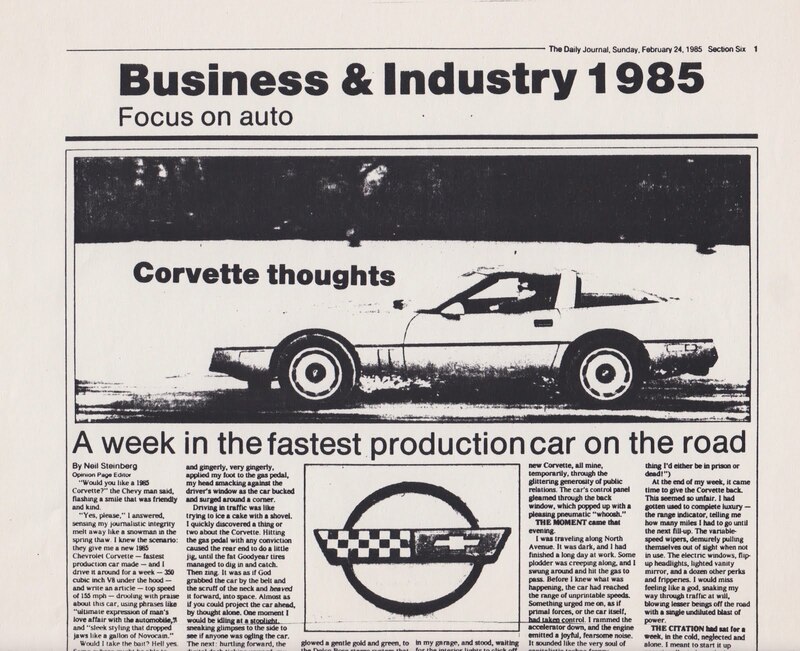 I knew the scenario: they give me a new 1985 Chevrolet Corvette—fastest production car made—and I drive it around for a week —350 cubic inch V8 under the hood—and write an article—top speed of 155 mph—drooling with praise about this car, using phrases like "ultimate expression of man's love affair with the automobile" and "sleek styling that dropped jaws like a gallon of Novocain." Would I take the bait? Hell yes. Some cyborg might be able to pass the opportunity or, worse, drive the thing and then produce a dry essay on the perils of excess. Not this cowboy. Pleasures in life are to be taken and enjoyed, and driving a Corvette is about as pleasurable as something can be. On Tuesday, I parked my little Citation—also a Chevy, but related to the Corvette in the same way Morris the Cat is related to a cheetah—in back of the office. Then I climbed int the cockpit of this metallic blue low slung beauty. I fired up the engine and gingerly, very gingerly, applied my foot to the gas pedal, my head smacking against the driver's window as the car bucked and surged around a corner. Driving in traffic was like trying to ice a cake with a shovel. I quickly discovered a thing or two about the Corvette. Hitting the gas pedal with any conviction caused the rear end to do a little jig, until the fat Goodyear tires managed to dig in and catch. Then zing. It was as if God grabbed the car by the belt and the scruff of the neck and heaved it forward into space. Almost as if you could project the car ahead by thought alone. One moment I would be idling at a stoplight, sneaking glimpses to the side to see if anyone was ogling the car. The next: hurtling forward, the digital dash ticking upward, my heart pounding as traffic became a bunch of specks in the rear-view mirror. The week I drove the car strange things started happening to my mind. Having been content to plunk along at a sane four-cylinder speed for years, I realized that incredible rates of acceleration were not at my fingertips. Then there was the thrill of being nestled in the middle of a command center of $27,000 worth of electronic goodies, from the all-LED digital dashboard that glowed a gentle gold and green, to the Delco Bose stereo system that had the friendly quality of extending the radio antenna whenever it was turned on. It was frustrating to lurch and crawl through downtown traffic. As soon as I got it out in the open and began roaring down the dark back roads of the northwest suburbs, I knew what was in store for me, sometime during the week. it would happen. The Total Speed Lust Experience. I saw the blank third digit of the speedometer, and knew what I had to do. But not the first day. I parked in my garage, and stood, waiting for the interior lights to click off. The lights stayed on for a few moments, to help the driver out of the car. Marvelous. The next morning, the day seemed unusually fresh. I dressed, grabbed a few cassette tapes, and vowed to push the car to its upper limits. I stood before the garage door a moment, musing on what was inside. Somehow, on that day, even the garage seemed like something out of an Andrew Wyeth watercolor. I pulled the door open, the ball bearings rattling an overture, and there is was. One new Corvette, all mine, temporarily, through the glittering generosity of public relations. The car's control panel gleamed through the back window, which popped up with a pleasing pneumatic "whoosh." The moment came that evening. I was traveling along North Avenue. It was dark, and I had finished a long day at work. Some plodder was creeping along, and I swung around and hit the gas to pas. Before I knew what was happening, the car had reached the range of unprintable speeds. Something urged me on, as if primal forces, or the car itself, had taken control. I rammed the accelerator down, and the engine emitted a joyful, fearsome noise. It sounded like the very soul of capitalistic techno-frenzy, screaming out a battle cry, as the lights along the side of the road blurred and fell past. Suddenly I was alone. For one glorious moment, nothing existed. Only silence. Top of the world. The the image of being dragged, in leg-irons, before a West Chicago judge filtered into my mind. Class X Felony Speeding. I shook myself, like a man fighting to wake up from a dream. I pressed the brakes, and watched the numbers slowly tumble down. Back to the world of normal speeds, like a diver rising up from the murkiest depths, leaving behind the wonder, back up to the dry, normal world. I checked my rear view mirror. No Mars lights. A sigh of relief. Can't let that happen again, I thought, picturing my lame explanation, "Well, you see, officer, ummm, I'm a reporter and, ah, I just thought I'd see just how, umm, fast..."
I noticed that the people who I let drive the car always laughed. The raw power would make them giddy and, weaving their way around traffic, they would laugh and reflect back to the muscle cars they drove as teenagers—the Barracudas, Boss 429 Mustangs, GTOs and Z28 Camaros. At the end of the week, it came time to give the Corvette back. This seemed so unfair. I had gotten used to complete luxury—the range indicator, telling me how many miles I had to go until the next fill-up. The variable-speed wipers, demurely pulling themselves out of sight when not in use. The electric windows, flip-up headlights, lighted vanity mirror, and a dozen other perks and fripperies. I would miss feeling like a god, snaking my way through traffic at will, blowing lesser beings off the road with a single undiluted blast of power. The Citation had sat for a week, in the cold, neglected and alone. I meant to start it up occasionally, to keep the battery charged, but with Corvette keys jangling in my pocket, who could think of a little front-wheel drive econobox? I parked the Corvette, ran my hand over the fiberglass fender, and climbed into the cold vinyl interior of the Citation. It felt odd to so suddenly move from the Corvette to this Spartan environment. No tilt-a-wheel, no tinted windows. Just an AM radio and the same linear speedometer found on every car since the Model T.
At least it started right up, and I muttered a prayer of thanks to the Chevy Corporation as I took the Citation out into the night. I required a moment to get used to it again, riding way up in the air on this little four-cylinder toy, something like being perched on a concert slab pulled by a donkey. I suppose there are people who can sit back, haughtily, and scorn something as common as a machine, as juvenile and artless as the love of a car. But is just that—a love—at the core of America's affection for automobiles, a fascination that causes monuments to excess, like the Corvette, to be adored by many and purchased by a few. And, like all loves, it is not really a good or bad thing. It just is. As time went by, the thrill of my week with the Corvette has faded into memory. 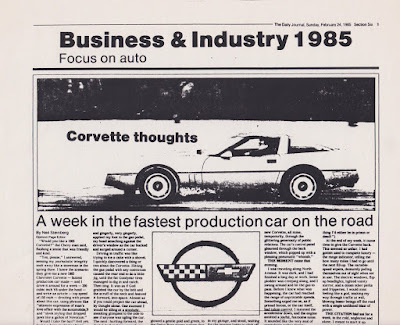 And yet, sometimes, while I'm poking along through slow traffic in my Citation, I'll get a far-away look in my eyes, and suddenly Corvette thoughts will come racing back into my mind, like the remembrance of a brief, wonderful love affair, now long past. Wow! High-octane, adrenaline fueled writing! Testosterone dripping from the page! I'd say the Wheaton Daily Journal was damn lucky to have you, Neil. Wow, a column from the 1985 Wheaton Daily Journal; I believe that's the oldest-dated column by Neil I've ever read. Thirty-three years ago seems like another lifetime. I knew someone who owned a Corvette, but I never really envied him, maybe because I couldn't conceive of me actually behind the wheel. As Tony alluded to above, driving a flashy car has always seemed a "guy" thing. Problems with owning a high performance automobile around here includeare, obviously, the traffic congestion that makes stop and go driving no fun, but also our straight, uninteresting, highways. To get that adrenaline rush, go to Italy, where the twisty terrain transversed by many roadways combines with the adventurous spirit of many drivers to provide driving excitement, somewhat dampened in recent rears by an overabundance of red light cameras. I've never had a problem with red light cameras. I have a preference for getting into pole position. That's funny! I like to spin it that way, too. Do you notice that you almost always catch up to the pack at the next light? A thoughtful piece by Chris Jones in today's Tribune about Hedy Weiss and her long tenure at the Sun Times. Unless I missed it, there still hasn't been an explanation of why she was let go. One hopes her bruising the tender sensibilities of some local theater folk didn't play a part in the decision. It's probably not possible for us to understand the restructuring of a business, from our vantage point. I was upset when Sue Ontiveros was let go. I wrote a letter, but as you can see, she's still gone. All we can do is trust the powers that be. We can only hope that Neil's number isn't coming up. Just saw The Gilded Age on PBS in which philanthropist Andrew Carnegie is depicted adhering to Herbert Spencer Darwinism in crushing the unions seeking a living wage. Can't but think that the powers that be yearn for those good old gilded days. Fortunately, there's nothing "gilded" about the Sun-Times. I don't know if they're changing course or streamlining. Maybe both, with a dose of survival mixed in. Whatever the case, without Neil and a few others, the paper would die. I think Neil's there as long as he wants to be.